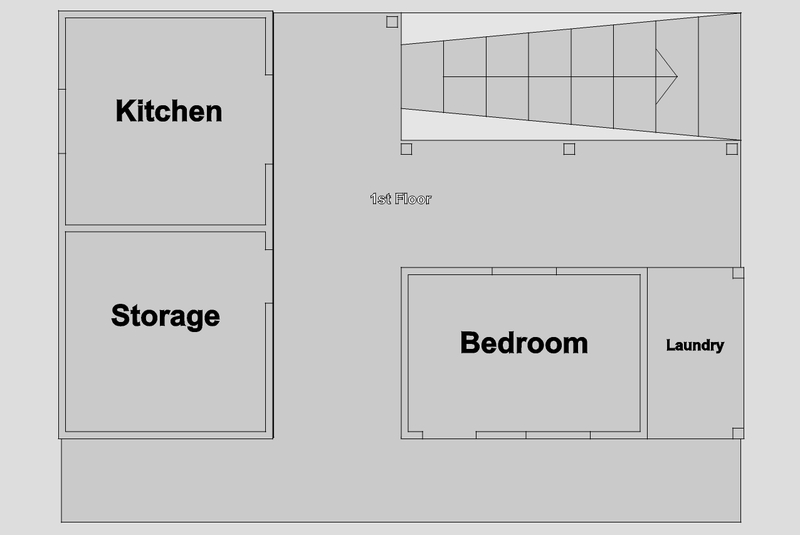 Below are floor plans for the house, first floor first and then the second floor. The bottommost edge of each sketch faces east, toward the Caribbean. Bad weather, when it comes, usually rolls in from the Caribbean. 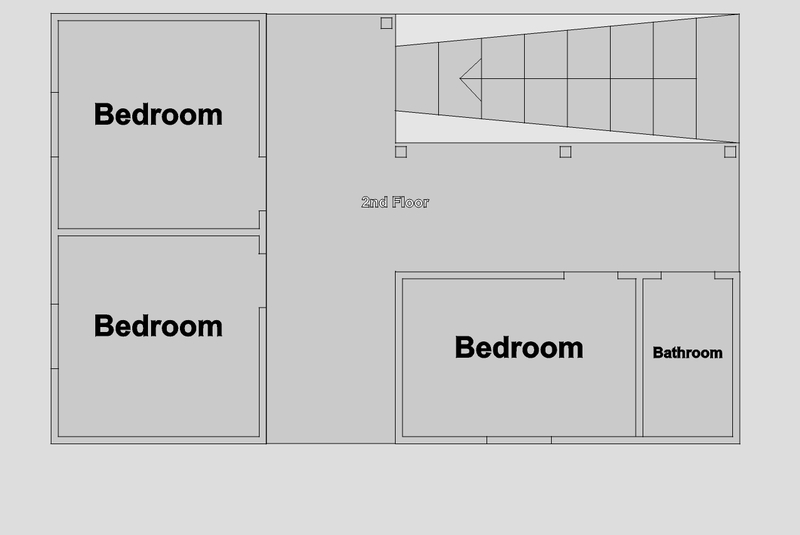 For this reason there are smaller or no windows on the east side of the house except in the living quarters of full-time employees...and when a storm hits that makes them shut both their east-facing door and window, they have a large west-facing window that opens onto a protected breezeway. A thatch roof covers the entire house: rooms, breezeways, and stairs. The covered spaces that are not named comprise open living areas...for simplicity's sake I call them breezeways because the breezes sure do flow through them. When heavy rains or winds do hit, the north-south breezeways provide protection while allowing life to go on (cooking, eating, reading, hanging-out, whatever). The windows in the kitchen (floor one) and bedrooms (floor two) on the south side can remain wide open even during a heavy rain from the east; and the thatch roof overhangs the east-facing bedroom window on the second floor enough that little or no rain gets in. 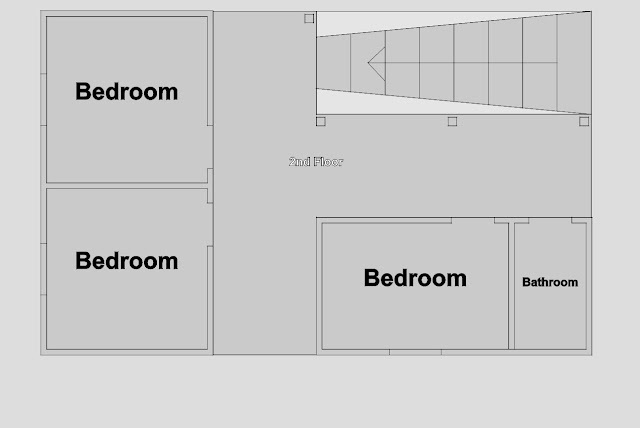 There is a walkway, also covered by the roof, that is shown at the front edge of the first floor sketch which is not duplicated on the second floor. It is concrete like the floors throughout all the first floor of the house: cool and easy to clean. Although the 'laundry room' is under roof, the roof being the second floor, it is open on three sides, having only the single wall which it shares with the first floor bedroom. 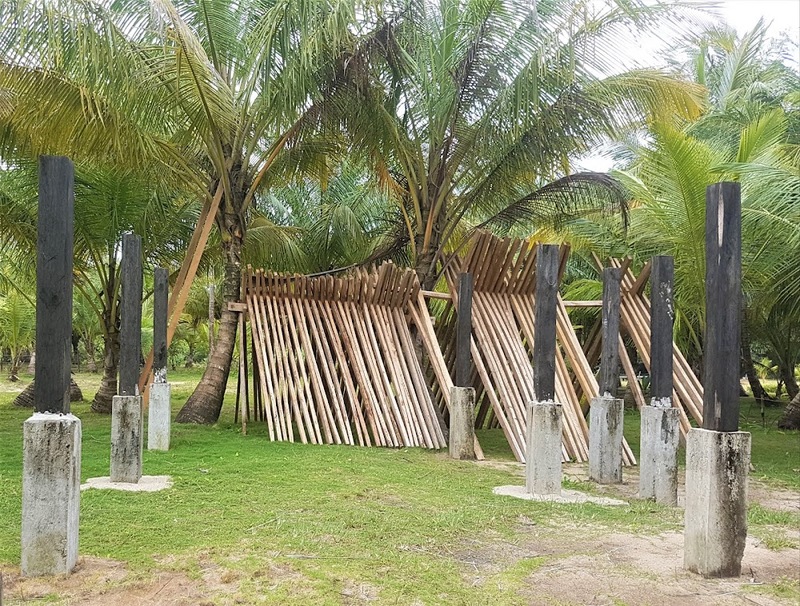 The storage room is as secure as we could get it, with no windows and two doors that are sandwiched back-to-back, one wood that opens right up to a second interior door of metal bars. The kitchen opening is about 6' wide and when the kitchen window shutters are open there's a lot of light. The kitchen opening has a double door of bars which can be secured when nobody's in the house. Stairs are stairs, but the treads on these are nice and wide and when we've got visitors they've served as seats. All the floors upstairs, except the bathroom floor, are wood...breezeways and bedrooms alike.